The Group Against Smog and Pollution (GASP) and the federal Environmental Protection Agency are partnering on the so-called School Flag Program, which debuted last week at the Environmental Charter School at Frick Park. “The School Flag Program was developed by the EPA, and it’s an engaging, hands-on way for students to inform their entire school and community about the region’s air quality and then to take necessary steps to minimize their exposure to high levels of air pollution,” said Karrie Kressler, of GASP. Each day students look at an air quality forecast and then raise a flag that corresponds to the level of pollution in the air for that day. With that information, school personnel can take any needed action. “Having an alternate indoor activity, shortening practices, having an asthma action plan or decreasing the amount of deep breathing during an outdoor activity are all actions that can be considered during days of high air pollution,” Kressler said. Green – Air quality is considered satisfactory, and air pollution poses little or no risk. Yellow – Air quality is acceptable; however, for some pollutants there may be a moderate health concern for a very small number of people. For example, people who are unusually sensitive to ozone may experience respiratory symptoms. 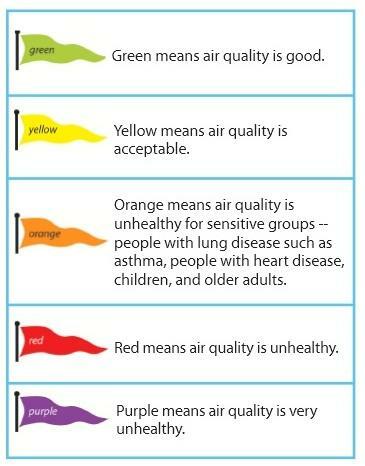 Orange – The general public is not likely to be affected at this level, but people with lung disease, older adults and children are at a greater risk from exposure to ozone, whereas people with heart and lung disease, older adults and children are at greater risk from the presence of particles in the air. Red - Everyone may begin to experience some adverse health effects, and members of the sensitive groups may experience more serious effects. Purple - This would trigger a health alert signifying that everyone may experience more serious health effects. There is a sixth level, maroon, but Kressler said there is no flag for that level, as it’s considered hazardous and nobody would be allowed outside to raise the corresponding flag. The School Flag Program is new to the Pittsburgh area, but there are plans to expand its reach. The program will run at the Environmental Charter School for the remainder of this school year and will restart in the fall. Pittsburgh’s air has gotten cleaner, but the city still ranks as one of the most polluted in the country. That's according to the American Lung Association’s annual State of the Air report released Wednesday. According to the report, Pittsburgh ranks eighth in year-round particle pollution, the mix of tiny solid and liquid particles in the air. These particles can increase the risk of heart and lung disease and adverse birth outcomes.